Did you know that one in ten blog posts are compounding? This means that organic search increases their traffic over time and one blog post could potentially send an army of traffic your way. Wouldn’t it be great if you could add a few more of those to your content archives? You can’t see me, but I’m nodding yes right along with you! If you don’t have time to sit and come up with fresh new topics and content ideas every day, you don't have to! You can repurpose your video or audio content into written content to populate your social media channels, website or blog. 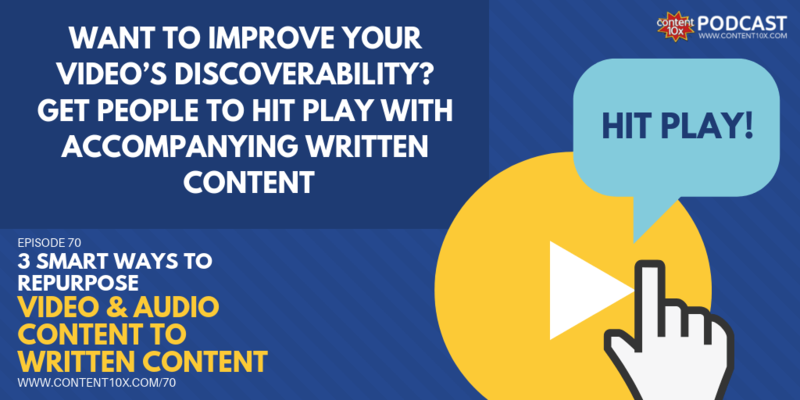 Accompanying your video or audio content with written content improves your discoverability. Yes, Google and the other search engines are getting a little more sophisticated, however, their fatal flaw is their lack of ability to effectively crawl video and audio content. It’s up to you as the content creator to give Google a helping hand to find your video and audio content. And, one of the best ways to do this is with written content. Optimized written content helps you to rank higher on Google. 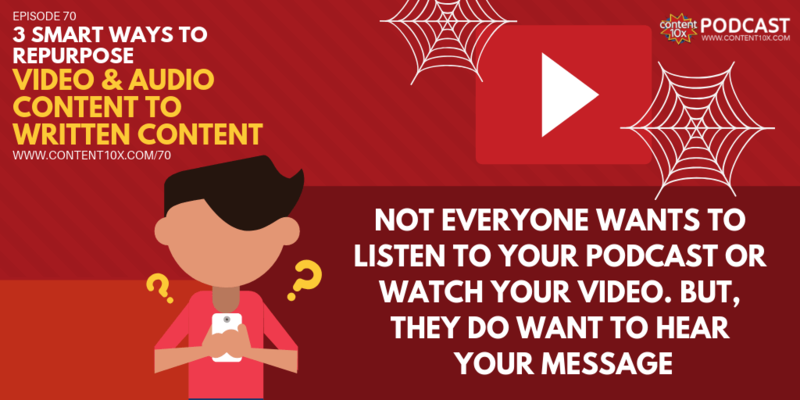 Plus, it helps people decide whether they actually want to listen or watch your content. Written content convinces people to spend time with you. It gives them a reason to hit play. Let’s not forget the fact that not everyone wants to listen to podcasts or watch the video. But, they do want to hear your message. 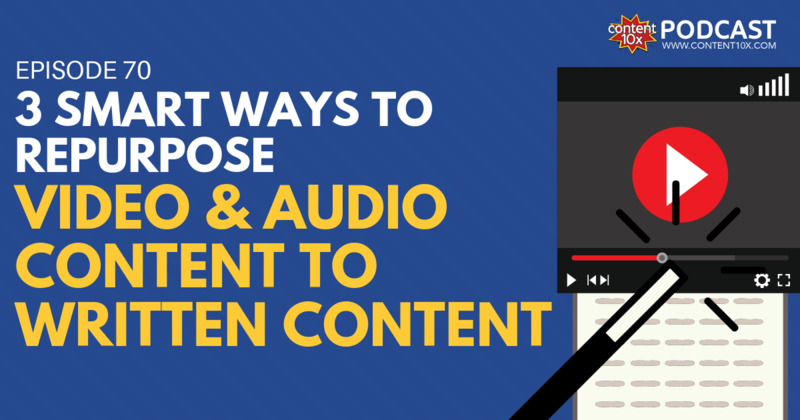 And so, repurposing video and audio into written content is about reaching those people too. For a more accurate transcript, you can hire a transcriptionist, but that would be the most expensive option. If you want to learn more about transcripts and what you can use them for, check out How Transcriptions Can Play A Key Role In Content Repurposing​. Now that you know how to get a transcript, it’s time to think about why it’s worth your time. One of the best reasons to start repurposing your audio or video content into a transcript is because it makes your content more accessible. It gives people who are unable to watch or listen to your video/audio content the chance to consume it, e.g. the visually impaired or those who don’t speak English as a first language. Transcripts also make your content far more search-friendly. Search engines can crawl your written content and get a feel of the context and intent of your content. It’s important to know that you won’t see a massive boost of SEO with a transcript, because search engine bots find them confusing to crawl, but it’s better than no written content to accompany your video or audio at all! You can even add a few clickable links to your transcript content, so you can direct people to any resources or landing pages you mentioned in the video or podcast, etc. In episode 45 of the Content 10x podcast, How Content Repurposing can Improve SEO With Andy Crestodina, we talked about all the ways you can improve your SEO performance by repurposing your content, including whether or not transcripts really have any impact on your SEO at all. While transcripts may not be the best for putting your content in front of more people on SERP’s, they can be an excellent tool for list building. If obtaining the written transcript is something that your audience would be interested in, you can provide it to them by email and grow your list at the same time. Whether you’re a podcaster or video creator, writing up show notes is a great way to create more useful content for your audience to consume. Usually, show notes are a summary of what was discussed in the video or podcast. At Content 10x, we tend to write an intro, summary in bullet points often, and useful links and mentions. The main purpose of show notes is to entice people to listen or watch the full video or podcast episode. You tease the content and let people know what they can expect from the complete version without giving the milk away for free! We’re a nation of skim readers (43% of people admit to skim reading blog posts​, I thought it would be more), so show notes are the perfect solution to cater to the skim readers of this world! You can take your show notes, level up a notch by incorporating relevant keywords within the text, and give your content a quick SEO boost. Forbes recently reported that long-form content, such as longer blog posts, are going to be even more important in 2019 and beyond. Search engines tend to see longer posts as more useful posts. The more information available, the more value it brings to the user. So, if you want to attract more people to your content, you’ve got to start focusing on creating lengthier posts that can be used as a quality resource for your audience. The good news is that you can easily repurpose your video or podcast into a longer form write-up without doing a whole lot of additional research. The article is based on the content of the video or podcast. It’s got to be far more than a basic rundown of your original content though. It has to be a blog post that can stand alone. To help drive traffic to your content, you’ve got to optimize your blog post by making sure you’ve included relevant keywords. You also need to optimize your meta tags including title tags, meta descriptions, headers, and image ALT tags too. But remember, SEO isn’t just about the robots crawling your pages. Keep in mind that content is for humans and keep a modest keyword density – don’t overstuff your posts! Once you’ve written your blog post, you can post it on other places besides your website such as Medium, LinkedIn or even as a guest post on a high-authority site, which will help build quality backlinks and improve your off-site SEO efforts. Don’t limit yourself – do all three! You don’t have to stick to one form of written content. You can try all three! You can begin with a transcript and create show notes for your video or podcast. Then, to top it off, you can produce a stand-alone article for your blog! Do you think you’ll try to repurpose your video or audio content into one or all three of these? Let me know in the comments!